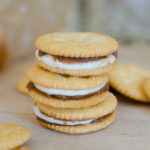 Musselman's Apple Butter is mixed with creamy peanut butter and then layered with white chocolate between buttery Ritz crackers for an easy sweet and salty snack. In a medium bowl, combine the apple butter and peanut butter until fully incorporated and creamy. Spread about a teaspoon on half of the crackers; set aside. In a microwavable bowl, heat 1 cup of the white chocolate morsels on high, stirring every 30 seconds until melted and smooth. Spread about 1 teaspoon on the remaining crackers. Melt the remaining morsels until all crackers are used. Match one white chocolate cracker with one apple butter cracker to create a cracker sandwich. Let cool at room temperature for 1 hour before serving.